We often hear quotes that emphasize the importance of coming together to accomplish a goal, but rarely do we make a conscious effort to really follow these quotes’ messages. 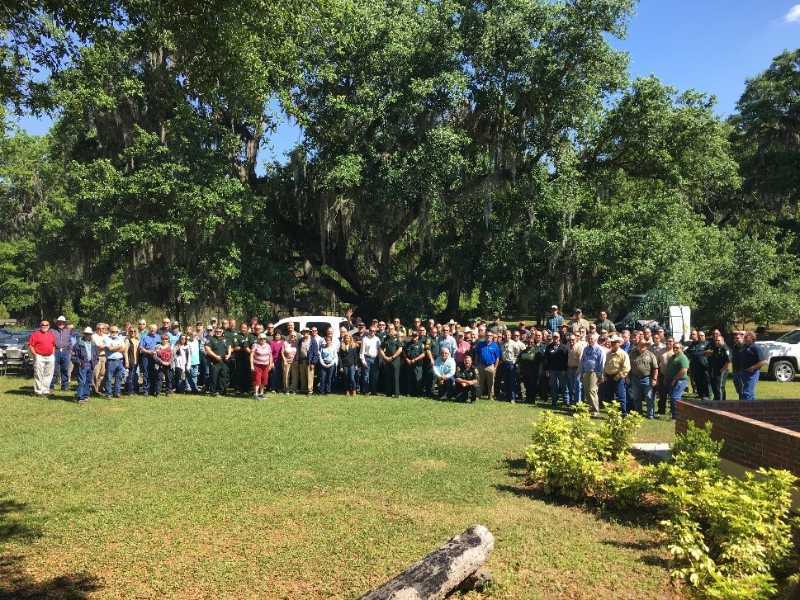 When it comes to the value of working together to accomplish a goal, Florida law enforcement along with the Florida agricultural industry have understood it for a long time now. This is apparent in the 1978 creation of the Florida Agricultural Crimes Intelligence Unit (FACIU), which is essentially an alliance between Florida’s law enforcement and agricultural workers. According to a news release put out by the Florida Farm Bureau itself, Florida created the FACIU, “to develop and implement solutions to the unique crimes that affect agricultural production and rural communities throughout the State of Florida.” In a current effort to achieve this goal, the FACIU, the Polk County’s Cattlemen’s Association, and the Polk County Farm Bureau hosted a luncheon for agricultural workers and local and state law enforcement at the Water’s Ranch in Bartow on March 21, 2019. In attendance at this luncheon were Sheriff deputies from across the state, agents from the Florida Department of Agriculture and Consumer Services, the Florida Fish and Wildlife Conservation Commission, the Florida Department of Agriculture, and the United States Department of Agriculture. At this luncheon, farmers and agricultural professionals along with state and County sheriffs and police officers could network with one another and provide each other intel on what Florida agri-business crimes and issues the FACIU should focus on solving next. Although networking events such as the Central Florida Ag Alliance luncheon is one key way that the FACIU stays on top of its mission to discover ways to help lessen the crimes that affect the Florida agricultural industry, other major tools the FACIU uses to fight agricultural crime include training sessions and seminars. In fact, the very first FACIU training conference was in 1980, with the support of the Florida Farm Bureau Insurance Group. With the Florida Farm Bureau being such an integral supporter of the Florida Agricultural Crimes Intelligence Unit for so long, it is no surprise that the current Florida Farm Bureau President, John Hoblick, presented the FACIU with a check to further support the development of more training seminars at the 2019 Central Florida Ag Alliance Luncheon. The FACIU is incredibly thankful for all the continued support of the Florida Farm Bureau. On top of thanking the Florida Farm Bureau, the FACIU and the Central Florida Ag Alliance luncheon would like to give a special thanks to Lightsey Cattle Company and Magnatronix Corp. for sponsoring steak meals for all the guests at the luncheon. It is because of the collaborative efforts of everyone in the agricultural and law enforcement community such as that given by these companies, that the FACIU will continue to be successful in decreasing agricultural crime.